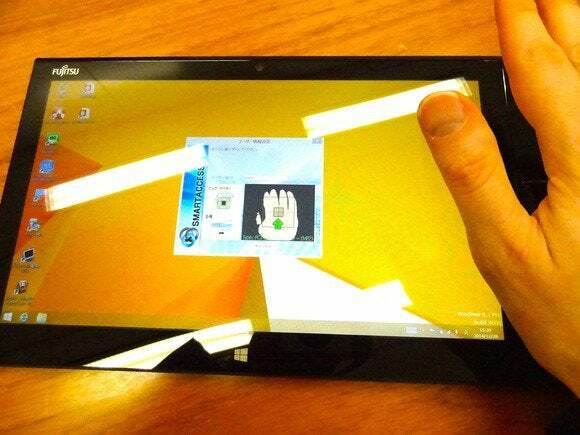 Fujitsu may incorporate its palm scanners in smartphones as a means of verifying a user’s identity. The company’s PalmSecure scanners use near-infrared light to scan points in veins that lie beneath the surface of a user’s palm. There has to be blood flowing through a user’s hand for the sensor to work. Every person’s palm pattern is unique, and scans of vein points are matched against previously registered scans to authenticate users and unlock whatever device or service they’re linked to. Fujitsu claims the biometric technology has a false acceptance rate of only 0.00008 percent and a false rejection rate of 0.01 percent. The company first commercialized the technology in 2004 when palm-sized scanners were embedded in ATMs at Japan’s Bank of Tokyo-Mitsubishi to help authenticate customer identity and prevent fraud. In-store scanners at Suruga Bank also appeared in 2004. Fujitsu later shrank the scanners and embedded them in laptops. It recently showed off a stamp-sized version of the scanner that is the smallest yet. It’s been embedded in tablets for the first time and will be included in about 2,000 tablets provided to Fukuoka Financial Group, which includes the Bank of Fukuoka, Kumamoto Bank and Shinwa Bank. “No one has this technology, and it’s significantly more secure than fingerprint,” the Fujitsu spokesman said, adding that some banks have shown interest in palm-vein scanners as a means of verifying identity in natural disasters in which ID or bank cards are lost or destroyed. The customized 12.5-inch Fujitsu Arrows Q704/H tablets have Intel Core i5 processors and run Windows, acting as virtual desktops. Bank employees meeting customers off-site will be able to securely access their bank’s internal system by using the palm-vein authentication scanners. Only users whose biometric info has been registered beforehand will be able to operate the tablets. At CES in January, U.S.-based biometric payments company PulseWallet demonstrated a cardless point-of-sale terminal incorporating Fujitsu’s vein-imaging technology. It said registered users could leave their credit and debit cards at home and make payments simply by having their palms scanned. Fujitsu would not elaborate on when it might embed palm scanners in smartphones or what brand they could be provided under.